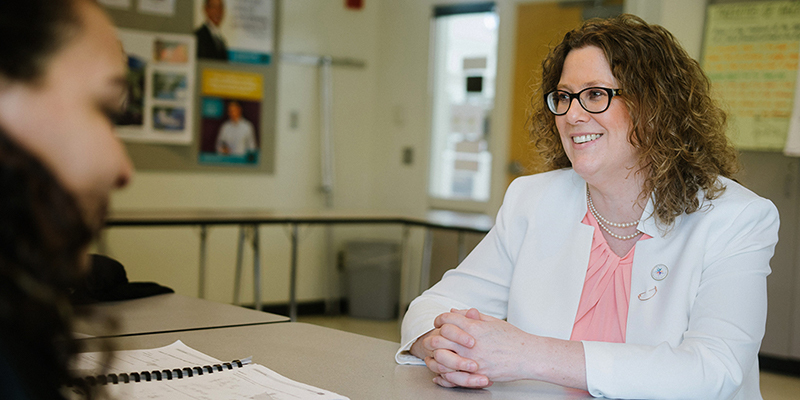 Before she was a teacher herself, or was even considering becoming one, McCann learned how a good math teacher instills confidence from Ken Golden, UVM professor of mathematics who retired in 2016. McCann remembers being deeply challenged by the exams in his high-level math courses, but she soldiered on, “showed her work,” as they say. Regardless of whether her answers were correct, Golden praised the thoroughness and insight he detected. “This is really great. You’re a superb math student,” was Golden’s overriding message. “What do you mean? I didn’t get any mathematical answer right,” McCann recalls thinking. Scary, but no more so than what her students face when confronted with this thing called algebra, and being able to relate as a learner ultimately makes her a better teacher. “That’s what feeds me. How do I reach more kids? How do I make the biggest difference and impact on their lives in the short time that I have with them?” McCann says. In April, she traveled to the White House to be honored together with the other top teachers from states across the nation. Media coverage noted that many of the honorees felt slighted by President Trump, who did not give the ceremony the attention of recent presidents. McCann concurs that it was an odd encounter in many ways. But she also found affirmation in her fellow dedicated teachers at the White House and a visit with Sen. Patrick Leahy in his office. “I love that man, love our state, love my profession, love my students,” she says.